The report throws to light some very interesting findings about the behaviors of e-buyers. As much as 78% of the surveyed population felt that pretty celebrity faces don’t influence their buying decision anymore. Quality is the numero uno consideration to go for a particular brand and not the pretty face, the product cover carries. 38% of the participants regarded quality to be the biggest reason to loosen their money strings. 19% worried more about getting their perfect size and 10% felt the lucrative price of the garment was the reason to buy. 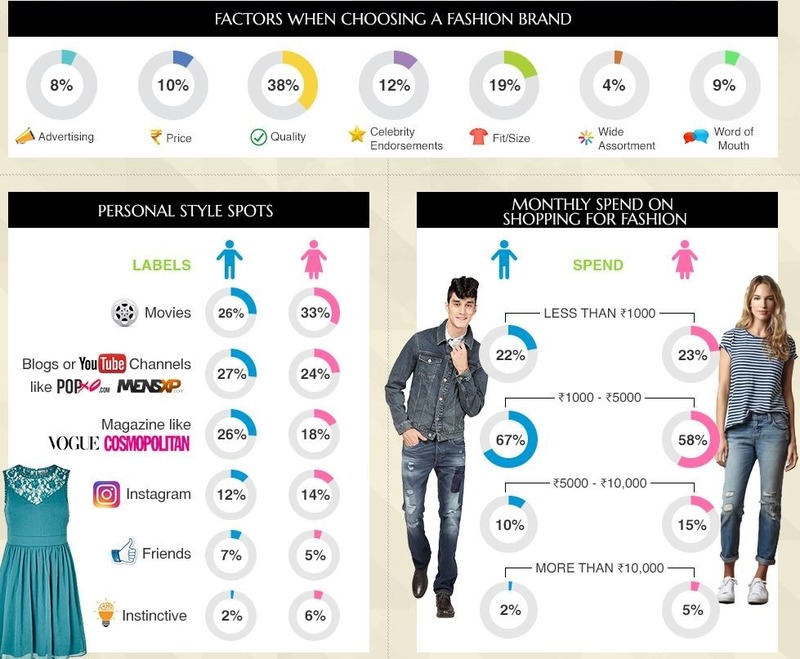 Jabong, Myntra, Limeroad, Abof and KOOVS were the most sought after fashion online shopping portals, while the favorite brands which sold like hotdogs were Puma, Nike, Levis, Allen Solly and Vera Moda. Almost 35% of the participants felt that online shopping was way better than brick and mortar stores. The drive to purchase is still banked on factors like “Half price sales”, “discounts and deals”, 71% felt discounts urge them to shop. For 16% of the participants, online shopping provided more convenience and 9% felt easy returns one of the biggest advantages of shopping online. However, it was noted in the survey that most purchases though driven by advertisement, Word-of-Mouth publicity has been a bigger driving force. The worst nightmares for online shoppers were extra delivery charges and not having the ease in quality inspection before delivery, while misleading appearance of apparel and improper sizes were the major set-backs of buying apparel online. Fashion is about utility, most respondents said. 62% of them would like slipping into comfortable clothes with a fashion quotient. Unlike the popular myth, men too are fashionistas. 29% of them agreed to have put in extra efforts in buying trending fashionable attire which was comfortable too. 67% of the men spent Rs.1000-5000 on average every month on fashion while 59% of the women spent around Rs.5000 on average every month. Again more than 15% of women didn’t mind spending Rs.10,000 on fashion while 10% of men spent more than Rs.10,000. “With the advent of online shopping Fashion as a category has blossomed with shoppers dedicating more time and budget to stay current with the new trends. CashKaro survey is a reflection of the buying habits of the Indian shopper clearly stating that majority of consumers now prefer to shop online as they have access to wide assortment, best Cashback & coupon deals coupled with the convenience to shop from anywhere.”, said co-founder of CashKaro.com, Swati Bhargava. Most of the choices of fashion for women came from movies and fashion blogs such as POPxo.com, fashion magazines like Vogue, Cosmopolitan and Instagram. For men too, movies was the biggest influencer in personal styling. One can safely say the online fashion stores are giving brick and mortar stores a run for their money. "Quality Matters, Celebrity Influence Does Not for Fashion Buyers: CashKaro Survey", 1 out of 5 based on 7 ratings. So true. I had a couple bad experiences with craftsvilla and I stopped buying all together from them. What people say influences them, and what in reality influences them – are two different things. Please watch Brain Games on Nat Geo if you are interested in the subject. It is natural for people that they are not influenced by shallow gimmicks by celebrity endorsements, but data analytics and sales figures tell a different story.